When you’re doing desserts, why go halfway? Rich in flavor and moist in texture, devil’s food cake is a favorite for chocolate-lovers. 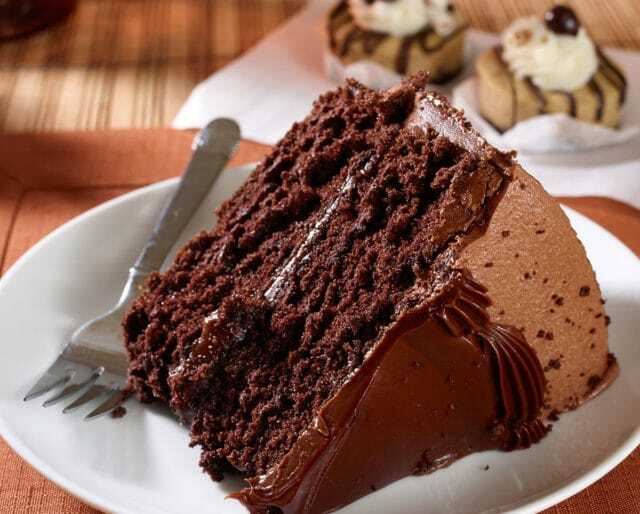 They get their chance to celebrate their love for the dessert on National Devil’s Food Cake Day, held on May 19. With devil’s food cake, you get all the taste, and all the chocolate. Devil’s food cake is not your ordinary chocolate cake. It’s a unique mix of ingredients that brings out the chocolate. Recipes often call for boiling water, instead of milk, and some even add coffee to bring out the chocolate flavor! Mixing science with desserts, the cake gets its darker color from its higher pH levels due to the added baking soda. The cake uses cocoa instead of chocolate squares, making it even fluffier! Some say the cake gets its name to distinctly contrast from the Angel’s food cake, which is much lighter in comparison. As more and more types of cakes have been created over the years, “devil’s food cake” is often used as a catch all name for a super-choclatety cake that doesn’t have nuts. Invite over all your friends and have a devil’s food cake taste-test. Judge cakes based on overall look, flavor, and moistness. Make sure to keep the baker’s identities a secret to not throw off any of the judging or sway votes! Give out prizes like the coveted blue ribbon or a coupon to take a baking class! This day calls from some extensive research. Do a little google-ing to see which places offer the extra-chocolatey goodness, and put together your delicious itinerary of stops to try. Take along a friend and see if you agree on which cake was the best! Make sure to take pictures at each stop and tag them on social media with #NationalDevilsFoodCakeDay! Although there are conflicting tales, and published cookbooks to contradict the story, legend has it that the devil’s food cake was created at New York’s Waldorf Astoria Hotel. One account even suggests that a customer loved the cake so much, that she asked for the recipe. The customer got the recipe, but it came with a price—the Waldorf also served her a bill for $100. Now that’s an expensive cake! Studies have shown that we enjoy food more when it feels like an indulgence, and nothing says "indulgence" more than a cake named after the devil himself. If we've had a bad day or are in need of some good old fashion chocolate comfort food, nothing feels like more what the doctor ordered than a slice of the richest most indulgent cake there is. Sure, a nice bundt or white cake can do the trick, but sometimes you just want something a little more. Devil’s food cake will cure that sweet tooth and leave you coming back for seconds. You can go even bigger by picking a version with rich chocolate frosting! Pair it with a nice cold glass of milk, or make it more of a treat with a cup of coffee! This cake is not for the faint of heart, or the casual chocolate enthusiast. This cake is for the serious, gotta have some chocolate fanatic. Over the years, devil’s food cake recipes have added more and more chocolate, even exchanging plain chocolate for cocoa to bring out the taste. The cake is widely considered richer, darker, and fluffier than regular chocolate cake.